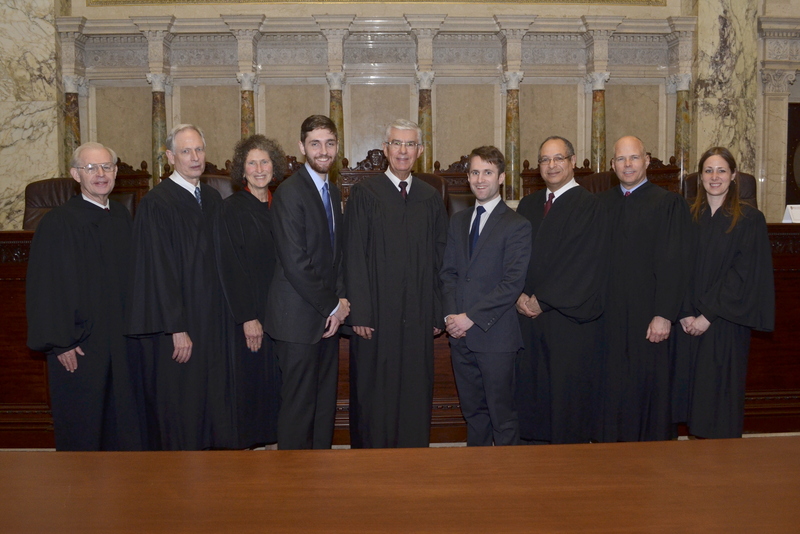 Sarah Dowd ’15 writes about a recent moot court victory. While many NYU Law students packed their swim trunks and headed to the beach to enjoy their spring break, Jeremy Schiffres ’16 and Will Simoneaux ’16 (and their coach, your intrepid correspondent) of NYU Law’s Moot Court Board packed their sweaters and headed to balmy Madison, Wisconsin, to compete in the Evan A. Evans Constitutional Law Moot Court Competition. Beachgoers brought home tans, but Moot Court brought home the gold! 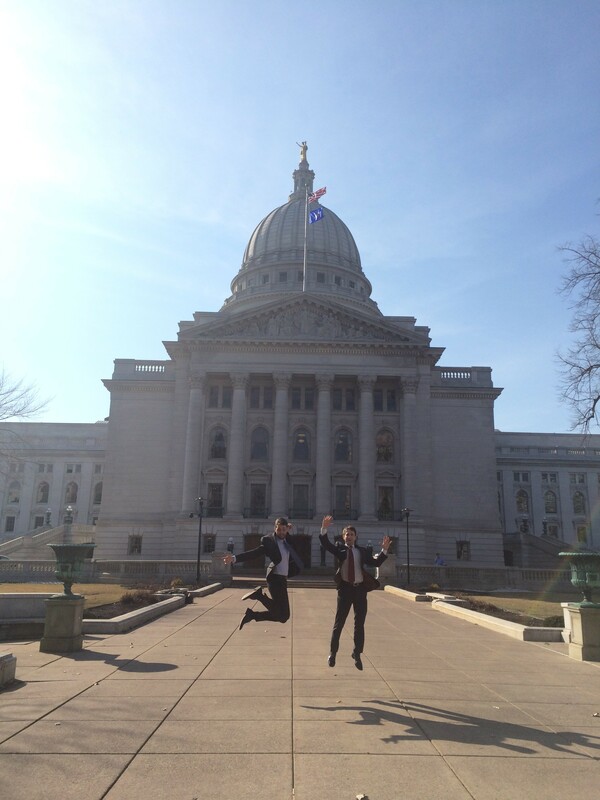 The Evans competition in which Jeremy and Will competed was hosted by the University of Wisconsin Law School and focused on current issues of constitutional law. Specifically, the issues they argued were about a fictitious state’s warrantless use of cell-site location information (the Fourth Amendment issue) and use of a particular lethal injection protocol (the Eighth Amendment issue). Leading up to the competition, they had to grapple with over 170 pages of record; a century’s worth of High Court precedent; the necessity of writing an elegant, compelling, and heavily Bluebooked brief; and countless practice sessions (putting the “moot” back in Moot Court) in which errors incurred the wrath of a well-aimed Nerf gun. But it was all worth it once our team made it to the competition, where, over three days and seven rounds, Jeremy and Will would argue one round for the government petitioner, flip next round for the inmate respondent, and then flip again with intellectual grace and poise back to petitioner. En route to the competition’s finals, they took down tough opponents from other schools, including the competition’s eventual Best Oralist winner and the authors of Best Petitioner Brief. I wanted nothing more than to see my boys make it to the finals, both because their closings brought me to tears, and, as a Wisconsin native, because of where it took place: the beautiful Wisconsin Supreme Court courtroom. Fueled by fried cheese curds, inspirational sports movie monologues, and compelling precedent, Jeremy and Will ended their triumphant run in front of a seven-person judge panel consisting of, inter alia, current and former Wisconsin and Oregon Supreme Court justices and a Wisconsin federal district judge. And fear not, readers, their efforts were rewarded with shiny Champion hardware. But most importantly, the three of us got to go and enjoy the rest of our spring break without having to parse the intent of the Founders—the truest spring break for any poor law student. This entry was written by Guest Blogger and posted on April 02, 2015.